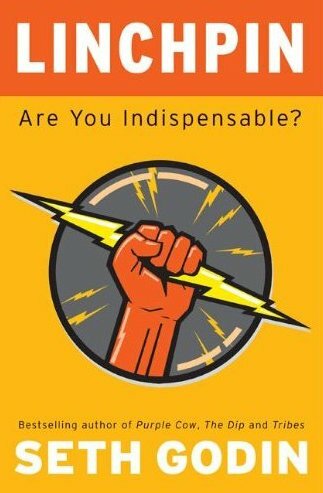 Thanks to a recommendation from a district staff developer I just finished reading Linchpin: Are You Indispensible? by Seth Godin . I’m recommending it for your reading. Here are a few of the statements I highlighted as I read with my comments added. Godin uses the term artist to describe indispensible people who do remarkable things. Many students need their teacher to be remarkable. Administrators and coaches should work with teachers to find their voice and spirit in their teaching. Teachers’ individual insights and connections to their students are critical to bringing out student’s artistry. As I read this piece I kept thinking that in many schools and classrooms we have rules that are lies. We suggest that success comes from following the rules. Signs in elementary schools frequently say, “Always raise your hand.” Yet my observations often show teachers rewarding outspoken students who bring interesting comments or questions into the discussion. Are too many elementary students playing school with the wrong rules? Tapping their own creativity is essential for teachers to create classrooms where students are practicing solving problems and leading. Those kinds of learning options don’t come from textbooks and teachers’ editions. To coach teachers as artists who do remarkable things, coaches and administrators must function as artists too…giving gifts to staff who give gifts to students. I agree with you Steve. Much of my thoughts this summer have been around how I can get my teachers to embrace the idea of more Project Base Learning. As you know some of my teachers do ,but not enough of them are willing to give up the control and trust their students. I believe is not only all the high stakes testing that we have but programs such as MAP that put teachers in a position where they are competing with each other and keeps them from giving students control. I plan to start my year with the article you mention from Newsweek. My question to my teachers will be -Do you believe all students are capable of being Creative? Why is it important for students to be creative? What role do you have in helping students develop their Creativity? As you ended your blog you mention that administrators must act like artist and give gifts to staff who in turn give gifts to their students. We must model what we expect in the classroom. This made me think of another comment that Seth Godin makes in his book Tribes. “There is a difference between telling people what to do an inciting a movement. The movement happens when people talk to one another when ideas spread within the community and most of all when peer support leads people to do what they always knew was the right thing. Great Leaders create movements by empowering the tribe to communicate. They establish the foundation for people to make connections, as opposed to commanding people to follow them. ” This goes hand in hand with PLCs. We need to move from the conference room to the classroom and empower our students to be their own learning community. Thanks for sharing the depth of your thinking and planning. Good luck with your ART! Thanks for eloquently sharing how Linchpin applies to education. The drop in creativity as noted in elementary Torrance scores since 1990 is alarming. I began to think about the standards movement that has also occurred during this time period. Many may simply state that our country’s decline in creativity is a result of the standards movement; however, I wonder if we need to be more intentional in our efforts to transform public education by ensuring that as we move toward standards based classrooms that we continue to emphasize creativity, problem solving, individuality, and differentiation for students, rather than “standardization” of teaching and learning. The standards are consistent, but we must find creative ways to teach and help students really learn in order to propel students forward. Why have we missed this as we have implemented the standards movement? Do you think that many misinterpreted standards? They saw it as a finish line instead of starting line. While Godin is certainly no big fan of standardization in anything (joining other critics like Ken Robinson, Pink, and Zhao), his criticisms of the education system are much deeper than the standards and testing movement. Godin makes the point that it actually goes back to the whole purpose of our education system being to create people who work in the factory, rather than people who make “art,” which he loosely defines as really anything of meaning and inspiration. When pressed, even the critics listed above will give that basic abilities in reading and math should be considered “21st century” skills that allow you to access more of what Pink calls “right-brained” higher order functions. Steve’s point that these should be considered a “starting line” and not a “finish line” is right on. Standards and assessments have a place in education and we should be using better tests and more sophisticated ways of using test data. But, we should always push against narrowing education to the test and focus more on creating more “artists” for the world. Thanks for weighing in….. narrowing is a big concern of mine.Continuous conversations defining “what is student achievement” are critical.